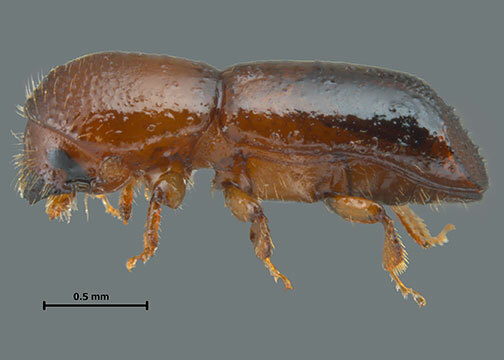 "The first time the redbay ambrosia beetle was encountered in the U.S. was in a trapping survey in Georgia in 2002," Riggins said. "It was sort of written off at the time as an oddity. No one knew much about it, and often when you catch an insect like that around a port city, it's not given much attention." "They eventually showed that the redbay ambrosia beetle vectors—or carries and transmits—the fungus that causes a disease called Laurel wilt," Riggins said. "We don't know why it makes these big jumps," Riggins said. "It likely happens in the movement of firewood or wood that people may be using for specialty projects. Redbay is not a commercial tree species, so it is not harvested for lumber, but some people like to use it for bowl turning or cabinet making." "The female will bore a hole and lay eggs, while at the same time inoculating the tree with a fungus that helps decompose the wood," Riggins said. "Most of the time, this is not destructive but part of the life cycle of a forest." "After a lot of sampling and a long time, we were able to show that all this destruction and damage was potentially from the introduction of a single beetle and the fungi she carried," Riggins said. "The vector and the pathogen entered North America as a single introduction." Riggins, who is also a professor in the MSU Department of Biochemistry, Molecular Biology, Entomology and Plant Pathology, examined the insects' genetic material and determined that although they are found from Texas to North Carolina, the insects are genetically identical. "We know that this enormous number of trees has been killed from a single-strain organism. That is unprecedented in biology," Smith said. "It was a pretty significant surprise for us to discover there was no genetic variation and a single-strain pathogen vector system has caused such diverse and severe damage across the landscape." The researchers published a paper on their findings April 9 in the journal "Biological Invasions." It documents the research that found a single founder event for the widespread devastation to the laurel species. "It's been a real tricky problem to figure out how to solve," Riggins said. "After the insect and disease got here, the fungus was laterally transferred to other ambrosia beetles, making it extra difficult to control. The fact that only one female beetle has to survive adds to the difficulty." "By the time the scope of the problem was understood, the beetle was so well established that there is not much we can do to stop it," he said. "But we don't have a way yet to control or stop the beetle in a natural forest," he said. "There's not a lot we can do to stop it at this point, because it's too expensive and too massive an undertaking." "This disease not only impacts the plants, but also other insects that feed on trees within that family," Riggins said. "Many insects could potentially be impacted by the extinction of native trees in the laurel family, so the problem radiates out in waves as insects are impacted by the death of their host."